The southbound Murder Creek interchange would be one of three to be closed. 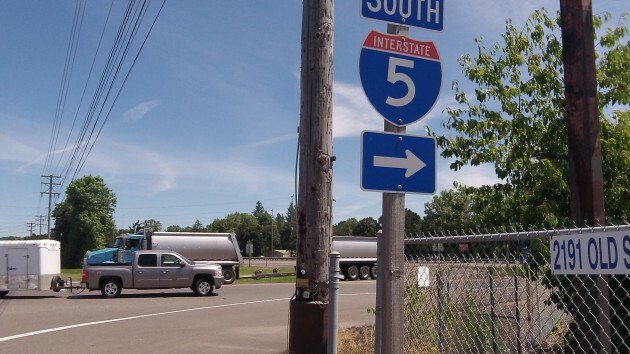 For the last 10 years or so, ODOT engineers and others have been planning how to make Interstate 5 function better in the Albany area, and last year they published a comprehensive plan covering the six miles from Santiam Highway to the South Jefferson interchange. Now they realize they’ll never get the money to do all this at once — one early estimate of the expense was $500 million — so they’ve given up on writing an environmental assessment for the entire project. Instead they hope that individual elements of the overall plan will get done if and when funding ever becomes available. I’ve been trying to keep track of this long planning process, and I noticed that ODOT’s project website promised an environmental assessment for late in 2014, to be followed by a public hearing early in 2015. With the year half gone, I wondered what was up. And as usual, Rick Little, ODOT’s spokesman for this region, came up with the answer. The plans worked up by ODOT staff and local advisory panels called for a third travel lane on I-5, major changes at the Knox Butte and Santiam Highway interchanges, construction of a new Millersburg interchange, closing the Viewcrest and two Murder Creek interchanges, and changes in surface streets near the freeway to make it all work. How much has been spent on this assessment so far? I forgot to ask, but a fact sheet published in 2010 said the environmental study required by the National Environmental Policy Act was estimated to cost $5 million. The interchanges in this area function just fine. Leave them be…all of them. The ONE thing that I see helping I-5 function better would be to simply add 3rd lanes from Hwy 34 to Salem in both directions. Yep, three lanes in both directions from Portland to Hwy 34. No need to change/eliminate any interchanges in the Millersburg and Jefferson area (well served) unless/until another bridge is built across the Willamette in the Millersburg area. Logic suggests the environmental impact of third travel lanes that simply reduce the width of the current median would be inconsequential. Albany, Jefferson, and Millersburg were well served with interchanges in the original I-5 design. Closures? Why? Major redesigns to these interchanges won’t significantly help anything nor be worth their cost. Those proposed expenditures could then be applied to the third travel lanes. It’s all about priorities. For all this massive federal debt (now over 18 TRILLION) our nation is ringing up against future generations, IF the monies were spent (wisely) for infrastructure, those future generations would get some benefit…..not to mention all the construction jobs created and the resulting boost to this stagnant economy. As it is, we’re just kicking the infrastructure can down the road for our kids and grandkids to deal with. Fire 3000 ODOT workers, quit wasting billions on light rail, and suddenly you have road construction money but of course the democrats who control this state will do nothing.